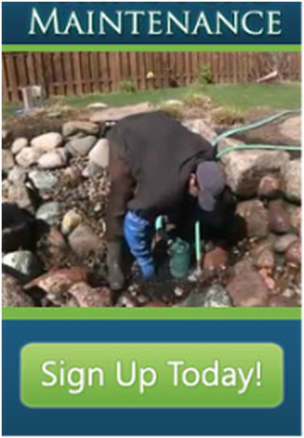 Interested in a Rainwater Harvesting System? 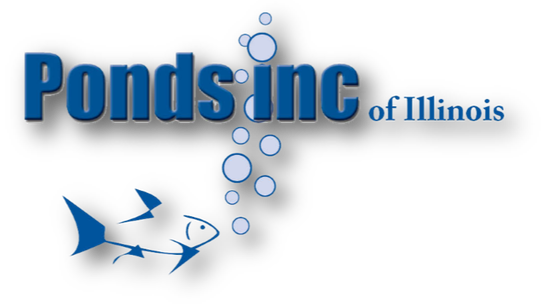 If you live in the Chicagoland Area and would like a consultation about how Rainwater Harvesting with the patented Aquascape RainExchange™ system can benefit you, contact us today! 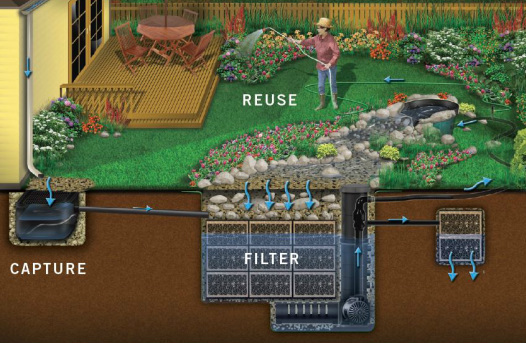 Rainwater harvesting is becoming a viable alternative for supplying our Chicagoland households and businesses with water. With continued urban growth and storm water runoff contamination, it is imperative to make certain that clean and healthy water is available for generations to come. It is also necessary to keep up with the demand on our water supplies. Rainwater harvesting is the collection of water runoff from a structure, typically a roof. It can also be harvested incorporating a Decorative landscape Fountain. The collection basin can vary anywhere from 50 gallons to over a million gallons, depending on your preference or need. The patented Aquascape RainExchange™ system captures, cleans, and recycles rainwater. For every inch of rain that falls on a 1,000 square foot roof, you can expect to collect approximately 600 gallons of rainwater. 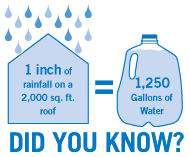 A larger square foot roof and a heavy downpour can net over 2,000 gallons of water in a single rain event! Clean, Filtered Water Collection & Storage - While you enjoy the benefits of a Landscape Fountain or Pondless Waterfall, the RainXchange™ Rainwater Harvesting System filters the stored water to prevent stagnation and growth of unhealthy bacteria. Wildlife Habitat - Because the water stored in the RainXchange™ System is constantly moving and being aerated, it becomes a sanctuary for wildlife. Water Feature Lifestyle - Enhanced landscaping improves property value and water features provide soothing sights and sounds that help you relax and de-stress in today’s busy world. Environmental Conservation - Capturing rainwater to operate the water feature creates true self-sustainability, drastically reducing the need for chemically-treated traditional water sources. ﻿How Can You Reuse Rainwater Using Aquascape's RainXchange™? Water issues have become an increasing global threat. Some areas see extreme flooding, while some have drought conditions. Demand and increasing population makes the availability of water a large environmental concern. Many areas in the United States experience low precipitation levels or near-drought conditions regularly. Currently, areas of California are experiencing extreme drought conditions. Wells throughout the country are having to be drilled deeper to access the lower water levels. Some wells are going dry. Metropolitan desert areas such as Las Vegas are seeing their freshwater supplies depleted. Desert communities have their water piped in. After rains, water runoff carries a variety of pollutants from fertilizers and pesticides in the rural areas, to dust, dirt and oils in urban areas. Runoff invariably makes its way into streams, lakes and other bodies of water. Runoff not only pollutes but erodes the banks and causes problem downstream. Rainwater harvesting through roofs and water features allows for reuse of water that might not otherwise be reused, and in the end, when mixed with environmental factors becomes harmful. In areas of water shortages, using rainwater is ecologically responsible when watering lawns and gardens. Rainwater can be used anywhere you use tap water. Besides lawns and gardens, ideal uses for rainwater include washing vehicles, washing pets, refilling fountains, ponds and swimming pools, and toilet and laundry facilities. When filtered properly, rainwater can be used for showering, cooking and drinking.